The Incredible Banker is a book in Ravi Subramanian's banking chronicles series. 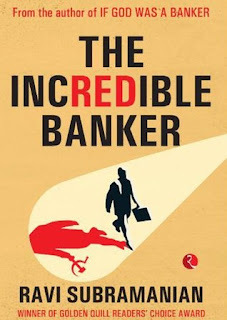 Incidentally, I have read its sequel, The Bankster (may access the review by clicking the link) in the past and was certainly one of the books from modern Indian writers which I have enjoyed. The plot of this novel jumps across timelines, starts with the CEO of Greater Boston Global Bank (GB2) receiving a show cause notice from the RBI which the CEO perceives to be a witch-hunt against foreign banks following the 2008 financial crisis. The story immediately shifts back by two years to the mundane work environment at GB2, with Karan Panjabi, despearately trying to meet his monthly targets and Deepak Sarup, head of internal audit division and his rival, trying to sabotage the performance of Karan's department. In the mean time, there is also a romantic sub-plot between Deepak, a married man and Savitha, a widowed woman and a staff of GB2 in Karan's team. In the mean time, the plot also moves to rural Odisha and West Bengal focusing on Naxals (communist insurgents) mobilising their resources and weapons. The best of all is the fact that all these events are connected in some way and the author manages to keep the reader in suspense till the last page. Usually the characters are the assets of an author in any story but here, the author didn't have them as there were too many characters across four sub-plots and even though Deepak would have probably been the most prominent, would certainly not fit being the lead. Thus, the only asset the author had remaining, to exploit was a strong plot and to be fair, he used it very well. The plot did move across different timelines but the author managed to maintain the suspense element essential for a thriller novel by doing that. Moreover, the crab mentality in the corporate world was portrayed fairly well by the author, as to how, more often than not, in a large decentralised organisation, individual interests often supersede that off the organisation. Added to all these, I also managed to finish the book much quicker than I expected myself to, considering it took me less than 24 hours to cover a 300 pages book. As a corollary, I would thus say that this book is pretty much a page turner which is also essential for a thriller novel. However, I cannot ignore the fact that I could not connect with any of the characters in the book and efforts could have been put into the same, even if it meant that the book would have been longer by around 50 pages. Since the author had put in no such effort into building the character, I found it really strange that towards the end of the novel, a 'girlfriend' of Karan is introduced who also happens to work at GB2 and provides him with vital information. Moreover, although this is something that I should be saying in the review of the sequel but since I posted its review way before, I'd have to say the same here - the structure that the author seems to follow seems too similar in both the books, various unrelated sub-plots and during the course of the plot, the author connects the dots. To conclude, I would say that The Incredible Banker is a good thriller novel, and it was quite commendable that the author managed to maintain the element of suspense till the very end. I also enjoyed this a little more than The Bankster despite the fact that the sequel had a stronger plot; because of the fact that I read the sequel before I entered the corporate world and reading The Incredible Banker now, I could appreciate the corporate politics much better in this book and I am sure this book could be enjoyed by those working in corporates who have a love for thrillers. I would award the book a rating of seven.